This, from my laid back, pragmatic 18-year-old. He’s very wise, but on this he is wrong. EVERYTHING, for me, is metaphor. Maybe I can blame my decades-old English degree, earned by dissecting books as if fetal pigs, prying loose each pickled piece to be parsed and analyzed, examined microscopically. Maybe it’s just who I’ve always been, a hopeful cynic, a nature-worshiping atheist in search of…what? Not answers. I don’t trust those, generally. Insight, maybe. Instinctively, reflexively, I seek to make some sense of my fellow humans or maybe even myself. I want to understand this human condition with which we’ve all been afflicted. A few weeks ago the sky fell. Or rather, the ceiling did. Water worked its silent destruction. A ruined roof shingle developed a pin-sized hole, and quietly, invisibly, over who knows how short or long a time, the rain did its worst. There were no hints or portents. One day we had a thunderstorm, no different than any before, but this time the pressure proved too much. The ceiling gave way. What should be held outside was suddenly in. 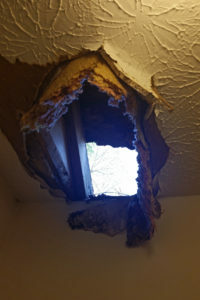 Sodden sheet rock and insulation hung from the gaping, dripping hole like spittle from a monster’s mouth. The ceiling had just been there, firm and clean. Now it was a mess. My life, metaphorically. How could I see it any other way? It had been a difficult few weeks, even before the sky fell. I’d struggled to solider on as always, like the Strong Woman™ I am. That label is a triumph and a burden. Lately the burden had grown heavy. I’d taken hits that slowed my momentum. Changes were constant and discouraging. I’d begun saying things like “I’m hanging on by my fingernails,” “white-knuckling it,” “circling the drain.” This is not helpful self-talk. But even Strong Women™ have a breaking point. When it is reached, if we dare tell, we may find ourselves disappointed by the response. Our loved ones are used to our self-reliance, our resilience. We look okay: the exterior appears as firm and clean as ever. There are no hints or portents of the mounting pressure. But one day: just one drop too many. Everything collapses. Everything is exposed. I can see the moon. It was a relief. I could no longer pretend to hold everything together. I had to confront the fact that this was never possible—too much is out of my control. In wreckage there is truth. It hangs like eviscerated innards for all to see, like dripping wet insulation. For a moment, I wasn’t strong. I fell all the way down. From the floor I stared up at everything I could not control and thought of metaphors. The collapse was mine, just in the nick of time. « This does not feel kind.